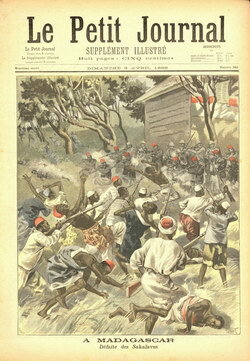 The full-page colour illustration on the front cover of this issue is entitled "À Madagascar: Défaite des Sakalaves" ["In Madagascar: Defeating the Sakalava"]. 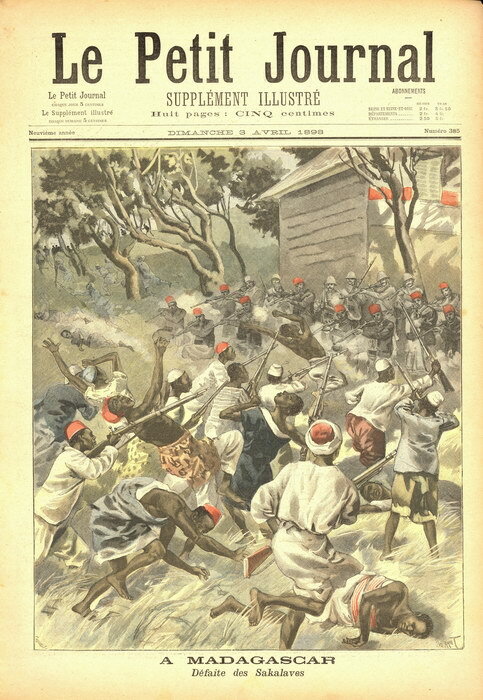 In Madagascar: Sakalava Defeat: The last dispatches from Majunga reported that on 22 February, at midday, the post at Ambiky-Ménabe was attacked by 400 Sakalavas. Our troops vigorously fought off these rebels and killed 53 of their men. We did not sustain any losses on our side. It appears that the result of this crushing defeat was considerable and that many natives surrendered. 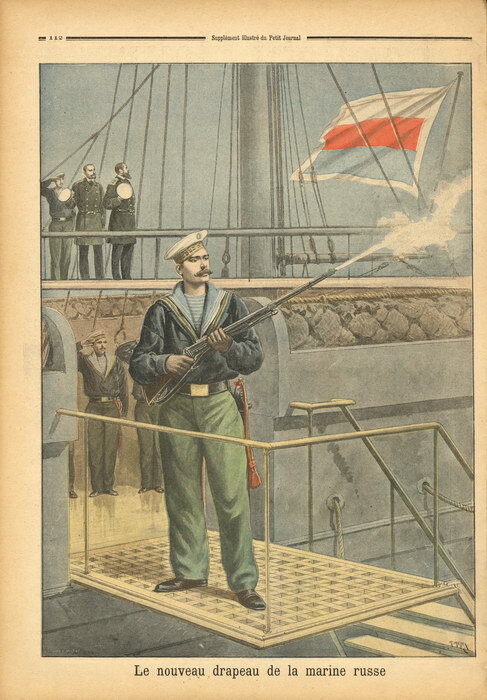 In spite of this clash – which all in all came as no great surprise because pacification of a large island like Madagascar cannot be achieved in a single blow – one can say that the situation in our African colony is still satisfactory. The general-governor noted this recently during a series of inspections in the circle of Ankazobe. Crossing this important region, which only last year was still desolate and deserted, the representative of France was hailed by an enthusiastic population that recognises the benefits of our administration. The natives regained confidence and went back to work; where less than two years ago there was nothing more than scrub, today one finds thriving crops and rice paddies. Local industries are revived; everyone contributes in his own way to the establishment of communication channels; advanced agricultural techniques are spread further, and popular, practical teaching develops quickly in the schools that are built. So these few isolated outbreaks of resistance – which are becoming increasingly less commonplace – cannot block the progress that we are pleased to report, and which the shrewd administration of our governor and his erudite colleagues will further with each passing day.